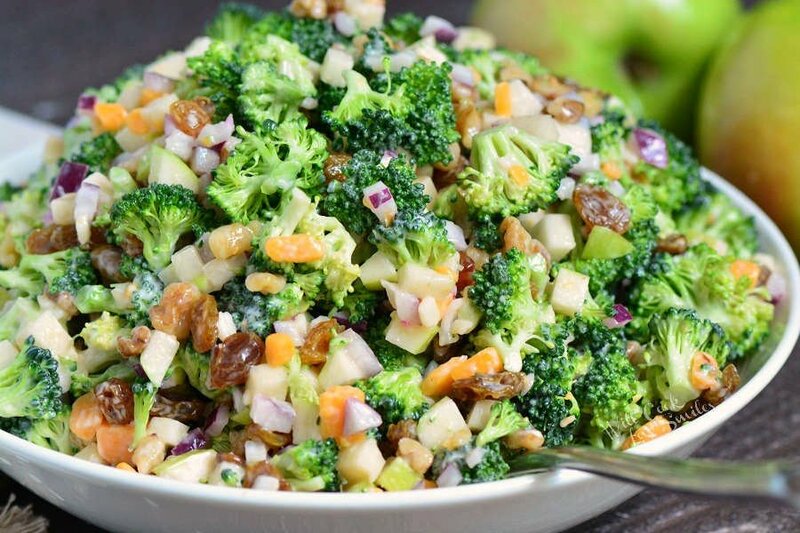 Broccoli Salad is a delightful combination of textures and flavors and a perfect side dish for any picnic, potluck, and outdoor party. 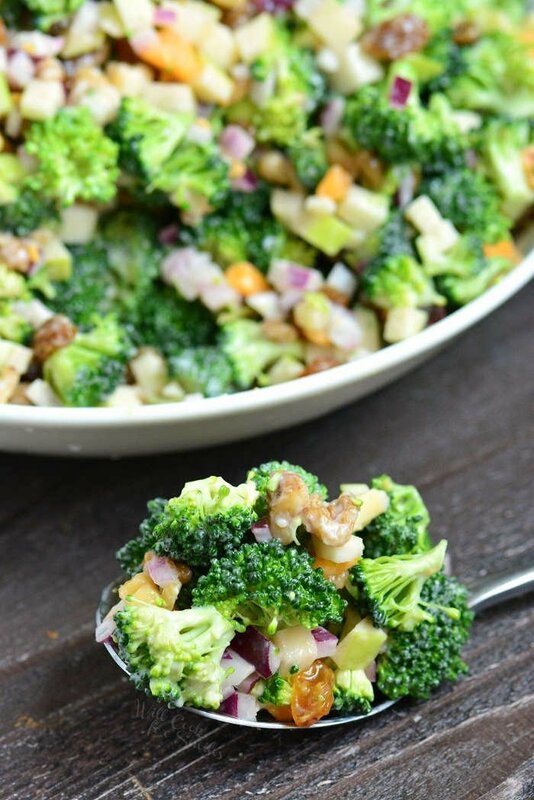 This broccoli salad is made with apples, walnuts, raisins, cheese crumbles, and red onions. Great sweet and salty flavors of this salad will compliment any meats. 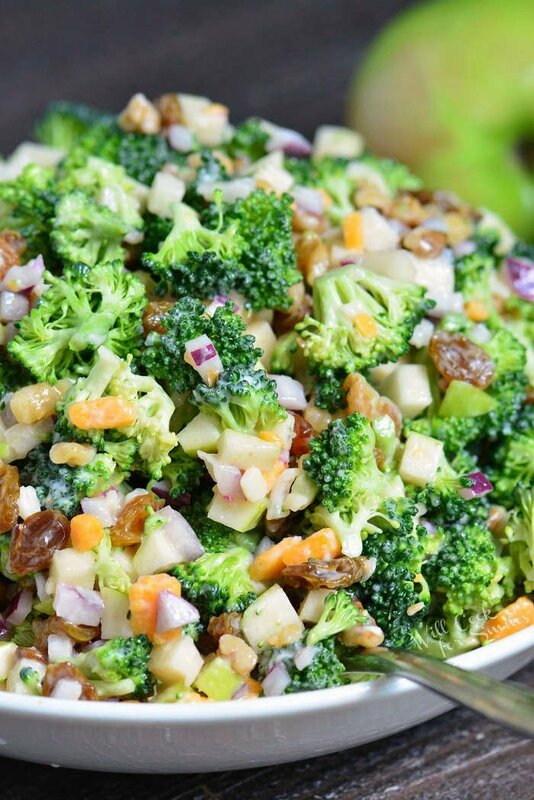 The best broccoli salads should have a great combination of textures and flavors. There is something crunchy, something soft, something sweet, and something salty in every bite. Everything you need to bring taste buds alive with every bite. There is something so pleasant about a sweet and savory combination of flavors together, in one bite. You get a sweet burst from crunchy apples and you can choose to use sweeter apples or sour apples, like Granny Smith. I really like Granny Smith apples because they taste sweet and sour at the same time. You also get some sweetness from raisins and red onions. Red onions make a sweet and savory addition at the same time. And, don’t forget the crunch from fresh broccoli and walnuts. I also like to load the salad up with as much cheese crumbles as the broccoli salad can hold. 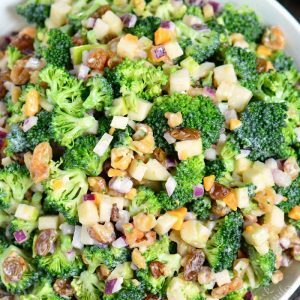 Its savory, cheesy flavor goes very well with apples walnuts and broccoli. You can easily find cheese crumbles around the same area as shredded cheese at the grocery store and not worry about cutting up a cheese block. Choose cheddar cheese crumbles or a mix of different cheddar cheeses. You can even vary the red onion and go with shallots instead. Shallots are little sweet and have garlic overtones. If you don’t like walnuts, don’t dismiss this salad. I know some people who can not stand walnuts in their food and that’s okay. You can easily substitute walnuts for pecans and even almonds. Both nuts will provide that special nutty crunch that will go so well with the broccoli and other ingredients. TIP: Prepare the sauce for the broccoli salad separately by simply combining mayo, sugar, and vinegar. Mixing it before adding to the salad will just ensure that all of the ingredients are evenly mixed with broccoli. Otherwise, you might end up with some broccoli that’s full of vinegar or sugar. CAN BROCCOLI SALAD BE MADE AHEAD? This is one of those side dishes that gets even better the next day because broccoli has time to mingle with other ingredients and soak up all the delicious flavors. You can easily prepare it a few hours before or even a day before and keep it in an air-tight container, in the refrigerator. Store leftovers in a storage container with a lid and keep it in the refrigerator. Leftover Broccoli Salad makes great side dish on busy weeknights. It will keep in the fridge for 3-4 days before starting to get a too soft. Make sure to use a clean spoon each time you take some out and close the lid back right away. The less exposure to air and bacteria, the longer it will keep. To make broccoli salad, you can use broccoli heads or already cut up broccoli florets. I prefer to cut my florets fresh because I can choose a fresh head of broccoli and I know it will last longer in the refrigerator. You can choose to peel the apples or leave apple skin on. If you choose to leave the skin on, make sure to wash the apples well. Core apples and dice it into small cubes. Peel and dice red onion into small pieces as well. 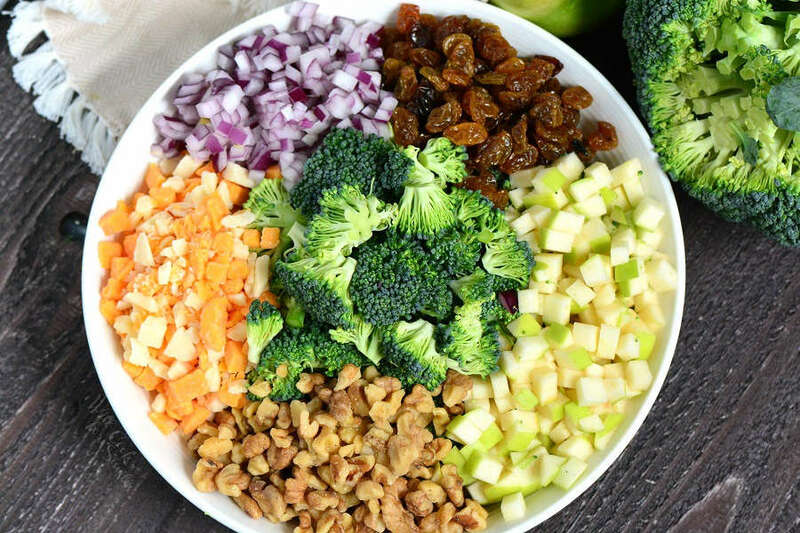 Combine broccoli florets, diced apples, cheese crumbles, red onions, crushed walnuts, and raisins in a large mixing bowl and mix it to combine. In a separate bowl, mix mayo, apple cider vinegar, and sugar until smooth. Combine the dressing with the broccoli mixture until everything is coated evenly. You can serve the salad right away or store it in an air-tight container in the refrigerator. 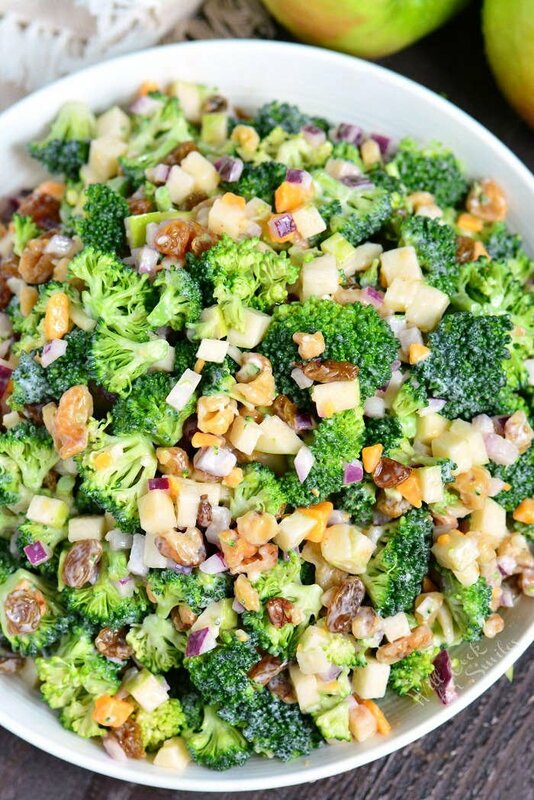 This broccoli salad is made with apples, walnuts, raisins, cheese crumbles, and red onions. Great sweet and salty flavors of this salad will compliment any meats. Note: you can choose to peel the apples or leave apple skin on. If you choose to leave the skin on, make sure to wash the apples well. Core apples and dice into small cubes. Peel and dice red onion into small pieces as well. You can serve the salad right away or store it in an air-tight container in the refrigerator. Broccoli salad should last 3-4 days when store properly. Wow ! Love this one of the best recipe. Your portal is really unique and also a good hub for the get amazing food trick.